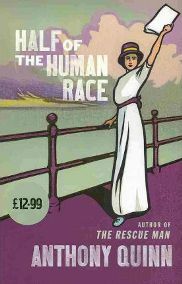 Half of the Human Race is a novel about a suffragette and a cricketer. In passing, it deals with a number of important historical events leading up to and during the First World War, which provides a gentle education for anyone unfamiliar with the era, this act as background for exploration of the central relationship which is at the core of the book. Connie Calloway is an educated and moderately privileged young woman with modern ideas. She is a rather naive product of her sheltered upbringing, but nonetheless committed to the idea of female equality and in particular to obtaining the vote for women. Will Maitland is a similarly educated and moderately privileged young man, coming from University and make a career as a professional cricketer with a county side. This book follows the burgeoning relationship between the two as they meet from time to time over the course of many years and failed to communicate effectively with each other about their feelings, despite clear and strong mutual attraction. In addition to the central characters, there a number of important minor figures. Most important of these is Andrew Tamburlain, a more working class figure who has been a great professional cricketer and who is struggling as he comes to terms with the imminent end of his career. The pain and consequences of declining celebrity is an important minor theme of the novel, and some of the sections dealing with Tamburlain are amongst the most moving of the book. He has an important role to play in the lives of both of the central characters, but is also a significant figure in his own right. One of the most impressive things about Half of the Human Race is its scope, both in terms of the period over which the story extends and the sweep of events which it covers. I learnt quite a few things about events of which my knowledge was scanty. However, this was incidental to a central story which was romantic, at times moving, and which managed at key moments to steer away from the easy plot line in favour of more difficult choices. Anthony Quinn writes very well — he clearly knows cricket well, and has carefully researched the suffragette period. Half of the Human Race could easily have become a fairly conventional piece of chick lit in other hands, but the choices which the author has made under way in which it is written raises it to another level. 2 Comments on "Half of the Human Race"
I really want to read this one, the Bookbag reviewer gave it a 5* review too. This one has been chosen for the TV Bookclub.